Leah Wood is an artist whose favorite form of expression is the hair style, color and texture she creates. Her passion for hair design is only rivaled by her love of helping others, which is one of the reasons she wakes up excited to walk through the doors of Enlighten Studio every day. Leah’s mastery includes Hair Extensions, Balayage and Color Design. She is known around the valley as one of Scottsdale’s premier hair extension experts. 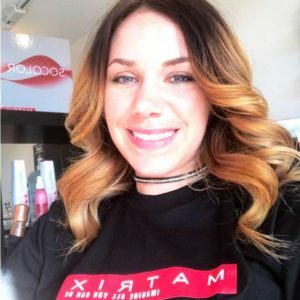 A lover of learning, Leah continues her education by attending regular Matrix Professional hair color trainings and Easi Hair Extension classes. When she doesn’t have a color brush or hair extensions in her hands you’ll find her researching, studying and blowing up her social media with the latest trends and styles. Leah is proud to admit she is addicted to her craft! Leah brings nearly a decade worth of experience behind the chair at Enlighten Studio where she was mentored by the salon’s owner, Matrix Educator, Yvonne Rosales. Leah attended Hair School in Ames, Iowa, but says that having a mentor like Yvonne was the catalyst she needed to transform her talent into purpose. Now, Leah is on the quest to mentor other young women and men in the hair industry by studying to become a Matrix Artistic Educator. One of the highlights of Leah’s career so far was volunteering her time and talent at Events for Hope, a fashion show benefiting the American Cancer Society’s Look Good Feel Better Program. The stars of the catwalk were women heroes who had battled cancer. Leah finds happiness: volunteering, hanging with her fur babies (Garfield, Little Foot and Chloe) her boyfriend Rob and her friends. She is also on board with spontaneous road trips to San Diego, Flagstaff or where ever adventure beckons. Although she considers Arizona home, Leah is a Midwestern girl who enjoys visiting her family back in Pocahontas, Iowa.